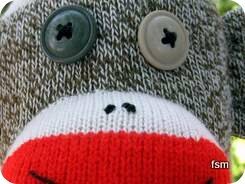 Do you want to find a super cute sock monkey costume for kids or adults? If so, lets see what we have found for you. OK, lets start with our littlest ones first. That would be baby size costumes. I kind of really like the practicality of the newborn sock monkey bunting costume. I remember swaddling my little fellas and the sock monkey costume looks like it might do the same job and it's cute too. I can't give you any personal feedback on how good the newborn costume is, my boys would not appreciate me trying it out on them at their ages now. They might get a leg in but that's no help to anyone. Right, moving on. There is an infant hat that is very cute and could be easier if your little one doesn't want to be stuffed into the bunting costume. The kids costumes are pretty cool, the girl's one is very adorable. The zombie one is perfectly gross for Halloween, a bit of blood, sharp teeth and crazy eyes. Not the usual delightful sock monkey but appropriate if you are wanting to get your zombie on and head out for some trick or treating. A very striped white and red outfit, makes me think of Dr Seuss and the Cat in the hat or Where's Waldo. It does come with a sock monkey face on the hat but that's as sock monkey as it gets, still cute though! 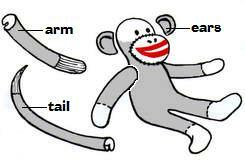 A perfect excuse to act like a monkey when you are wearing a sock monkey suit. Just grab a bunch of bananas and you'll be all set for a fun evening of monkey-ing around. If you need to keep warm there are a couple of full body, head to toe outfits that will keep you covered. If you are somewhere warm or just need a outfit that doesn't cover nearly every part of your body then the women's monkey costume might be what you are after. It comes with a hat, scarf (just don't expect it to keep you warm), dress and knee-high socks. When you are finished with your costume you could always turn those knee-highs into a sock monkey. 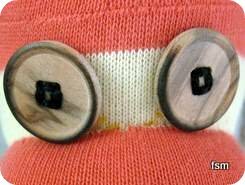 If you don't want to go the whole hog you can always just grab the sock monkey hat. 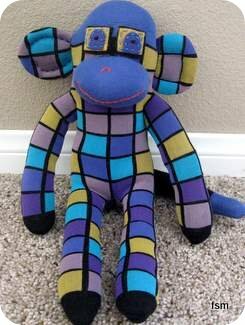 So, plenty of choices to get your monkey on, as much or as little as you'd like.